MAXQDA can automatically code the text of up to 100 authors and 100 hashtags from imported Twitter data. When you import Twitter data, a dialog window will appear in which you can enter the author names and hashtags you wish to autocode. Alternatively, you can open the function via Analysis > Twitter > Autocode Twitter data. In the “Hashtag” column, the different hashtags are listed, and in the “Tweet” column you can see the number of tweets in which the hashtag appears. In the upper left corner you can see how many different hashtags were found in total; the top right shows how many of these hashtags are currently selected. 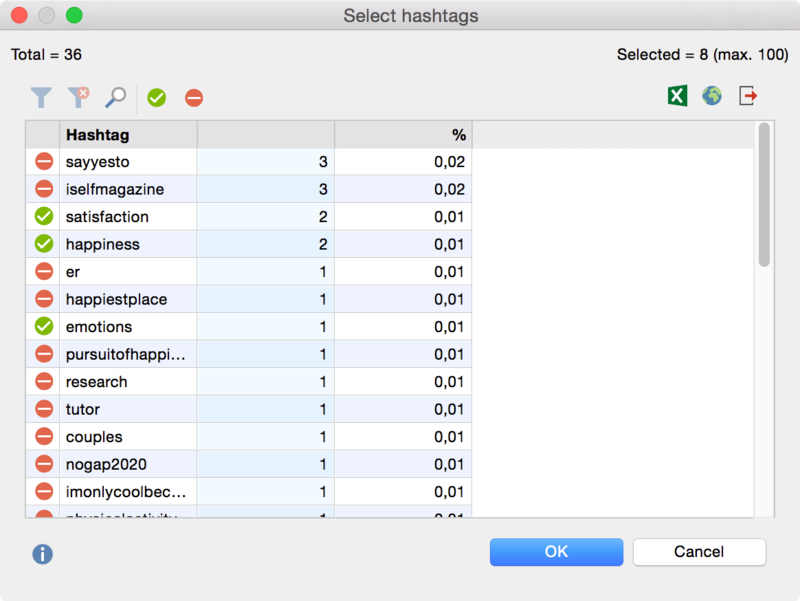 How do you select the entries with the hashtags that are relevant to your analysis? Select the desired row. As usual, you can select multiple rows by holding down the Ctrl key (Windows) or cmd key ( Mac ). Your selection will be highlighted in green. Click the green checkmark symbol in the upper toolbar. A green checkmark will appear in front of the the selected hashtags. This procedure can be repeated as desired, or reversed by selecting a row and clicking on the Stop icon to deselect an entry. Note that a maximum of 100 entries can be selected. When you click OK, you will return to the Autocode dialog window, where you can proceed in the same manner with author names. 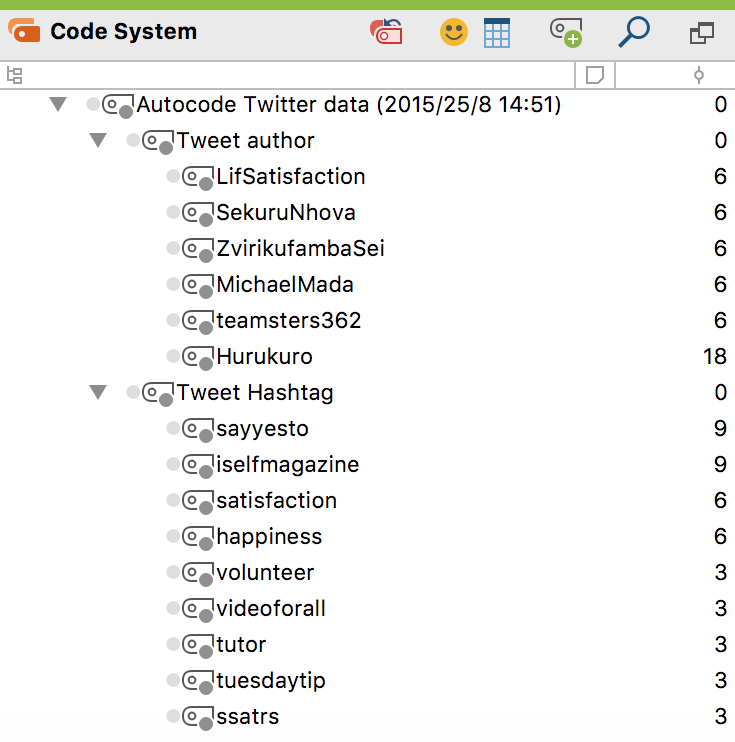 When at least one hastag or author name is selected, the Autocode button becomes available and can be clicked. MAXQDA then begins the autocoding process, which may take a moment depending on the number of entries. The resulting new code “Autocode Twitter data” with the date will be inserted at the top of the Code System. In the automatically generated code, “Tweet hashtag” and “Tweet author” appear as subcodes of the selected hashtags and author names. For the analysis, they are automatically sorted in descending order of frequency. The hashtags and author names that appear most often in the tweets are at the top. The codes can be managed like any other code – for example, you can change the color or arrangement, depending on what makes the most sense for your analysis. 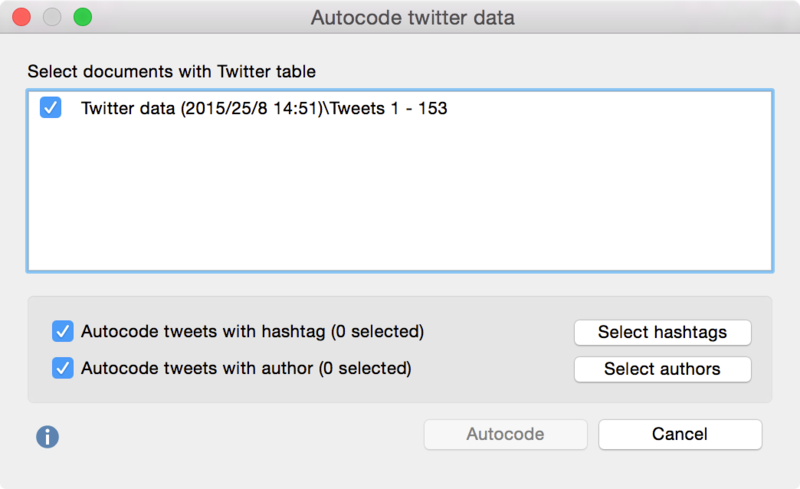 Please note: Via Analysis > Twitter > Autocode Twitter data you can open the autocode function as often as needed. It is therefore not necessary to perform the autocoding process immediately after import. Activate one or more documents with Twitter data in the Document System. Activate the codes with the relevant author names in the Code System. The result will be a compilation of all relevant tweets, which will appear in the “Retrieved Segments” window. If you are using MAXQDA Plus and therefore have MAXDictio available, you can use this compilation of tweets to perform a simple word frequency analysis. Go to the MAXDictio tab, select Word Frequencies and check the option Only in retrieved segments. Further analysis options, especially when delaing with several thousand tweets that have not been autocoded, MAXQDA offers further analysis options including filters, word-based functions and statistics.